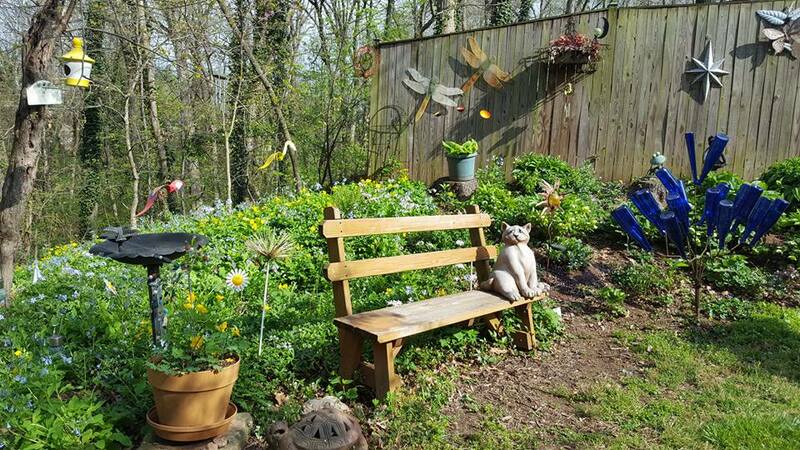 The Prince William Wildflower Society welcomes the general public to its nearly Annual Spring Garden Tour, an educational event to highlight the use of native plants in the garden. None of our featured gardens uses natives exclusively. Visit these gardens on Saturday, April 20, any time between the hours of noon and 5 p.m., rain or shine. The Endrikat and Wheatcraft gardens have been on previous tours; the Beaverson garden is on tour for the first time. Start at any of these gardens and use your favorite online mapping program. Watch for small bright pink directional signs near the gardens. View or download the Spring Wildflower Garden Tour Flyer with directions to the gardens. For further information, contact Nancy Vehrs at 703-368-2898 or nvehrs1@yahoo.com. This property offers a lesson in contrasts. The front is a typical suburban yard, but behind the fence is a certified Audubon-at-Home habitat garden planted primarily with native shrubs and perennials. Huge boulders, a large pin oak, silver maple, and a collection of mature eastern red cedar trees anchor the garden beds. A fringe tree is the focus of a bed that also includes several viburnums, mountain laurels, pinxter azalea, and native grasses. Amidst the cedars and pin oak grow an American hornbeam, dogwood, redbud, spicebush, columbine, wild bleeding heart, bloodroot, mayapples, and much more. The sweet bay magnolia island contains inkberry hollies, Virginia sweetspire, amsonia, and native summer perennials such as rattlesnake master, milkweed, and Joe Pye weed. The north hillside border features a maple, elderberries, and red twig dogwoods. An easement beyond the back fence adds to a sense of wildness. A planting of bulbs, shrubs, and perennials, including native columbine, defines the entrance to this large, dry woodland garden. Mayapples, cardinal flower, closed gentian, Virginia bluebells, and sensitive ferns grow in a wetter area at the beginning of the driveway. Beds beside the driveway and in front of the house are planted with dwarf crested iris, phlox, violets, green and gold, spring beauty, lyreleaf sage, wild geranium, dogtooth violets, toothwort, and hepatica. Native shrubs such as azaleas, winterberry holly, fothergilla, strawberry bush, witch hazel, spicebush, and several viburnum species are included in the beds. Green and gold, butterfly weed, native trumpet honeysuckle, purple coneflower, and beardtongue grow in the front sunny bed. Foundation beds feature native sweet pepperbush, viburnums, and perennials such as wood poppies, twinleaf, wild bleeding heart, turtlehead, Jacob’s ladder, maidenhair fern, and bluebells. Woodland beds behind the house contain additional wildflowers and shrubs. Near the street is a small, sunnier area maintained as a wildflower meadow. In a surprisingly wild setting in the city, mature hardwoods provide shade for a woodland garden behind the house and for a dramatic slope down to a small ravine. An observation deck overlooks this area and a circular path leads through it. Redbuds, dogwoods, and clumps of Christmas fern occur naturally on the steep slope. Colorful Virginia bluebells, wood poppy, toothwort, wild geranium, white violets, and blue woodland phlox can be seen from the path. More wildflowers, including columbine, Jacob’s ladder, bleeding heart, trillium, and nonnative hellebore, are planted beside paths leading through the garden. Both native wisteria and trumpet honeysuckle cover the trellis leading into the back yard. Serviceberry and viburnum are planted near the house, and a large bed planted with bulbs, native shrubs, and perennials at the front of the property provides additional color. Throughout the property whimsical decorations delight visitors. Refreshments will be served at this garden.